A glacier range the size of the state of New York surprisingly contributes 10 percent of the world's melting ice, making it a primary contributor to rising sea levels. Researchers have been watching this glacier range in the Canadian Arctic Archipelago for decades, but because of its remote location they weren't able to get accurate readings of how much it was being affected by the gradually increasing temperatures, particularly in summer, attributed to global warming. NASA, in making ice loss estimates in the early 1990s, had determined that the glacier had been losing volume. Gardner looked at more recent changes: during the years 2004 to 2009. Over that study period, he found, the glacier lost a volume equivalent to about 75 percent of Lake Erie, the majority of that loss happening between 2006 and 2009. In these years, the loss was four times what it had been in the late 1990s. The Canadian Arctic Archipelago includes thousands of islands covering 550,000 square miles (1.4 million square kilometers), nearly the size of Alaska. It is home to one of the largest freshwater glacier ranges on Earth, which has 3½ times the volume of the combined Great Lakes. To test how much ice these glaciers were losing, Gardner's team created a computer model and used climate data from 2004 to 2009. They noticed this dramatic loss of ice and called colleagues to confirm their findings. A team from Trent University in Ontario, working with the ICESat, a NASA satellite that can measure elevation using a laser beam from space, confirmed Gardner's findings that the glaciers had been losing volume. A third team, working with the GRACE satellite, a joint venture between NASA and the University of Texas, also confirmed the findings. With these findings, the archipelago snags third place among locations of the world's greatest ice loss, though it contains a very small portion of the world's land ice. The huge ice sheets covering Greenland and Antarctica, which contain 99 percent of the Earth's ice, also come in first and second place, respectively, in volume lost. The archipelago -- which makes up a third of the remaining 1 percent -- is able to compete with these behemoths because it is in an area where a few degrees of temperature change can have a great effect on melt. Essentially it's not as cold there as it is in Antarctica and Greenland. "The big ice sheets have large areas at high elevations and large areas that are very cold," Gardner said. "Despite their very large size, proportionally they experience less melt." All of this water has to go somewhere, and it ends up in the oceans. "In winter these ice sheets don't melt at all, so it's very confined to summer months," Gardner said. "It's like a giant faucet turns on for two months, then shuts off." 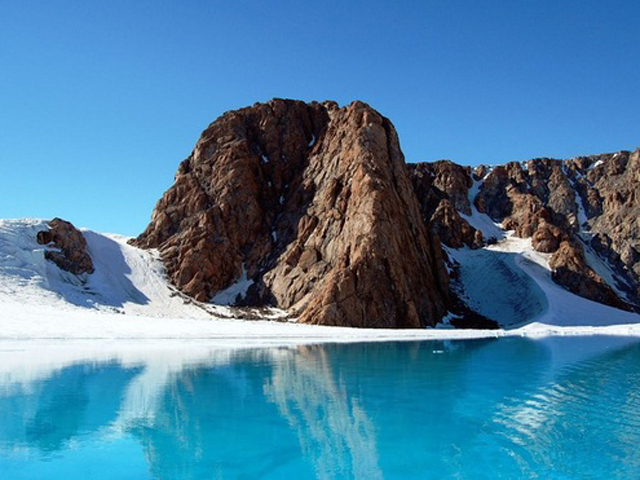 The fresh water in the glacier range is lost into the oceans and the sea level rises. Gardner is currently working to apply his glacier melt model to go back in time, using historical climate data, to put this ice melt into a longer-term perspective on the health of the glacier.